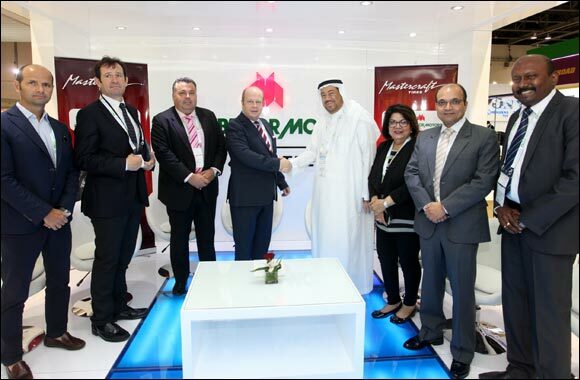 Al Habtoor Motors Tires & Batteries, the exclusive distributor of Mastercraft tires in Bahrain, Saudi, Qatar and Oman, has appointed MOK Trading Est. as the Authorized Dealer of Mastercraft Tires in the Kingdom of Saudi Arabia (KSA). Mohammed O. Kabli, CEO of MOK Trading Est., Karl Hamer, Managing Director of AHM, Jagdish Parulekar, CFO of AHM, Roma Andrews, Executive Director of AHM, Neil Coolledge, General Manager of AHM Tires & Batteries Division, John Jayachandran, Manager of AHM Tires & Batteries Division and Christophe Huss, Regional Manager MEA and Mediterranean were present during the official signing, which took place during Automechanika Dubai, 2015. 'MOK Trading will introduce Mastercraft's comprehensive line-up of automotive tires for passenger, light truck, SUV, and commercial vehicles in KSA. Furthermore, the MOK team will be receiving the full marketing support of AHM Tires & Batteries to establish, build and increase brand awareness in KSA.' said Neil Coolledge, General Manager of AHM Tires & Batteries Division. Mastercraft Tires are manufactured by the parent company of Cooper Tires, the Cooper Tire & Rubber Company, the second largest tire manufacturer in the United States. Since 1909, Mastercraft Tires have been crafted for durability and design. Its compounds and tread patterns designed to maximize tread life without sacrificing traction or ride quality—all at a price that’ll keep the customer moving. They have earned a reputation for building high mileage tires and 100 years later continues to build car tires to today’s highest quality standards. Offering a wide variety of tires for various automotive applications, Mastercraft tires are built to achieve a smooth ride without sacrificing performance. From Courser and Avenger to Strategy and SRT Touring, Mastercraft tires come with features like rubber rim protectors to keep the wheels scuff-free and low rolling resistance for better fuel economy. It’s a combination that makes Mastercraft tires a great value no matter where the road takes the driver. Mastercraft Passenger car tires are designed for drivers who want optimum ride comfort, all-season traction and attractive styling. They are available for a diverse range of vehicles including passenger cars, minivans, small sport utility vehicles and crossovers. Its Sport utility tires with the perfect balance of brawn and beauty are perfect touring tires designed to deliver higher levels of wet traction, ride comfort and appearance. Mastercraft Light truck tires are for those who want all-season performance and who demand the utmost in off-road traction. These tires are available for many vehicles including light trucks and vans up to 1 ton. When it comes to heavy duty applications, Mastercraft Roadmaster commercial truck tires are designed to perform in all applications from long haul highway to demanding off-the-road conditions. Engineered for retreadability, these tires deliver durability and excellent traction to reduce independent truckers and fleet’s operating costs. Mohammed Omer Kabli Trading Establishment (M.O.K.) is a Saudi Arabian establishment based in Jeddah specializing in car service and distribution of a large variety of high quality spare parts. Universal Car Maintenance, MOK Trading Establishment's flagship, began as a niche market provider of mechanical and electrical services for American cars. Today the company has 5 workshops and 4 parts outlets in Jeddah. In addition, it has expanded its operations by opening new branches in Riyadh and Dammam. As a global competitor with a primary focus in the replacement tire industry, Cooper Tire & Rubber Company, together with its affiliates, subsidiaries and joint ventures, has manufacturing facilities on three continents, sales and distribution networks around the world, and products that meet and exceed the demands of the world’s most dynamic markets. Cooper has maintained a competitive position among tire manufacturers in this country. It stands now as one of only two U.S.-owned tire manufacturers. Cooper is the fourth largest tire manufacturer in North America and the 10th largest in the world, shipping tires to more than 155 countries and employing nearly 13,000 people worldwide. Today’s Cooper is a smart, innovative company capable of connecting in consumer and specialty markets around the world. Cooper provides a full line of tires to meet the needs of virtually all consumers from everyday motorists to the most demanding high-performance, off-road and motorsport enthusiasts.